Sometimes here at Petswelcome, in our search for all things pet friendly and pet related, we find something that is so great and fantastic that we feel the need to share it with our Weekly Bone readers. Recently, while researching information for our upcoming Top Pet Friendly College Towns, we came across a section on the University of Pennsylvania website that highlights the Penn Vet Working Dog Center. The Center is a national research, breeding and training center for detection dogs, covering many different types of detection including Accelerants, Bed Bugs, Explosives, Human Remains, Medical Detection (including diabetes and ovarian cancer) Narcotics, and Urban Search and Rescue. There is no doubt about it. The dogs at the Penn Vet Working Dog Center definitely do amazing things. The center opened on September 11, 2012, and is dedicated to the proposition that dogs are the best tool we have to detect and alleviate potential threats, which include both natural and man-made disasters. They are pioneering new approaches to working with dogs by utilizing collaborative research and the latest scientific and veterinary findings to enhance the performance of the dogs. In addition to training dogs in detection, the center also has specialized programs such as K9 Law Enforcement, which trains local, state and federal agencies to train and handle dogs so they can build a K9 unit for their own departments. They also have a K9 Performance Medicine program that offers fitness training and rehabilitation to K9 dogs or competitive sport dogs that have been injured in the field. We highly recommend you check out some of these dogs. They are listed on the site by breed, gender or job. Many are named after handlers or dogs who were deployed to the World Trade Center after the attacks on 9/11. There is Hoke, a Lab who specializes in accelerant detection and was named after handler Julie Noyes’s dog K9 Hoke who went into the World Trade Center. Hoke now works for the Salina Fire Department. Or Quilty, a bed bug detector named in honor of Lt. Michael T. Quilty, from Ladder 11 of the New York City Fire Department. Or Punches, a Diabetes Alert Dog named after 9/11 victim Jack Punches. 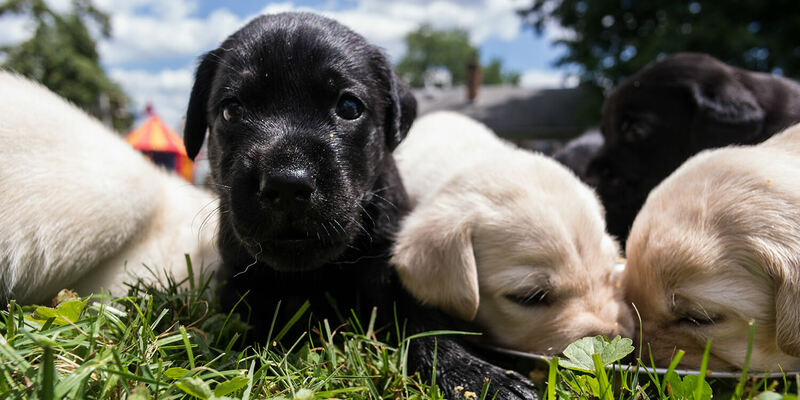 There are also dogs available for sale, many of whom have their own YouTube videos such as Déjà Vu ,who specializes in single purpose scent detection. Most importantly, you can get involved with the Penn Vet Working Dog Center in a lot of different ways. You can make a gift, which will support training, research and other essential needs. You can sponsor a puppy, which allows you to follow the progress of your puppy in training. Or you can become a foster family and provide a temporary home during evenings and on weekends for a dog in training, helping your dog develop socialization skills. So what’s this got to do with pet friendly travel and hotels? Nothing, really. But in a 24-hour news cycle that sometimes overwhelms us with bad headlines and disaster videos, it’s a beautiful thing to see a human and dog working hand in paw to make the world a better place. They not only help make us safer in the future but also honor those who have made the ultimate sacrifice in the past. We just wanted to give a shout out to the Penn Vet Working Dog Center and say, Thank you! Keep up the good work.